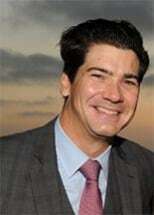 JOHN W. MELVIN, is a 2002 graduate of the University of Cincinnati College of Law, and a visiting student at the University of San Diego School of Law. He was an Editor on Law Review and was elected Chief Justice of the Student Court while at the University of Cincinnati College of Law. He graduated with honors from Emory University in 1998. He was admitted to the State Bar of California in 2002, and is also admitted to practice in the federal Southern and Central District Courts. Mr. Melvin’s extensive civil litigation background includes numerous trials, hundreds of depositions and mediations prior to joining Frisella Law, APC. Mr. Melvin has handled a wide range of multimillion dollar claims, including real estate disputes, construction litigation, business litigation, and served as general counsel for an established real estate investment company. Mr. Melvin enjoys spending time with his wife, who is also an attorney, and his two sons.